Nashville Indiana Links The quaint village of Nashville is a great place for a romantic getaway, with hundreds of unique craft, specialty & antique shops, and great music & theatre venues. Visitors enjoy watching artists in galleries and craft studios throughout Brown County Indiana. Brown County is known as the "artist colony of the midwest". And, we have great FIREWORKS! So join us on the 4th of July. Please look at our LODGINGS in BROWN COUNTY INDIANA with AVAILABILITY (and hot tubs) all year long. Come Stay with Us! Craftsmen work in shops and studios in the village and around the Brown County countryside. ROMANTIC HOT TUBS, Live ENTERTAINMENT, Antiques, Mountain Bikes, ZIPlines! Brown County Indiana is a wedding destination. If you want to have a big fat wedding party or just want to elope, BROWN COUNTY WEDDINGS can make your day special. 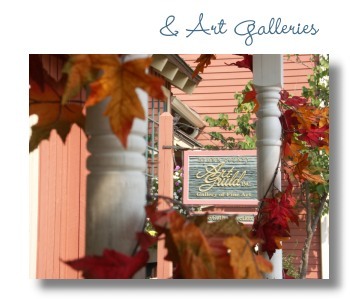 Come and Enjoy the art galleries and music venues, outdoor adventures, wineries and craft beer breweries. Enjoy AUTUMN in Nashville, Indiana... Come Eat, Drink & GET MARRIED! Enjoy ALL SEASONS in Brown County Indiana...Come Shop, Drop & Relax in a HOT TUB! Little Nashville's Brown County Playhouse has returned as a great entertainment venue. The Little Nashville Opry is expected to rebuild this year. The Palace Theatre re-opened in the old Ordinary as a dinner theater. Melchior Marionette Show and The Handbell Choir downtown Nashville have been entertaining visitors for years. BROWN COUNTY STATE PARK is every Hoosier's favorite playground. Visitors come to hike, bike, swim and trailride. Kids love the ponies and playgrounds. The Dance Barn is smoke free fun and golf can be enjoyed at Salt Creek Golf Resort 18 hole course. Rawhide Ranch and Paintball Valley offer exciting adventures including paintball and ziplines for young people. Brown County State Park, Lake Monroe Reservoir and Yellowwood State Forest provide outdoor activities for all ages. The Bill Monroe Bluegrass Park offers nationally known stars during the bluegrass music festival season. Brown County is all about outdoor adventure. Brown County State Park, Yellowwood State Forest, Lake Monroe, Hoosier National Forest, Rawhide Ranch, Explore Brown County, Valley Branch Retreat. Grab a bike from Hesitation Point and do the dew. Trail ride from the saddle barn in the park or Schooner Valley Stables. Zip the Holler Hoppin Zip Lines or rent a Wilderness Canoe. Don't forget Paint Ball. Getting married in Brown County Indiana has become "The thing to do!" Just like Gatlinburg and Vegas, Brown County Indiana has wedding chapels and outdoor gazebos. Tie the knot outside near Brown County State Park, or inside at the Abbey Chapel. Have a great Reception at Salt Creek Golf Resort or Mike's Music & Dance Barn. Honeymoon in a romantic hot tub room or private cabin. 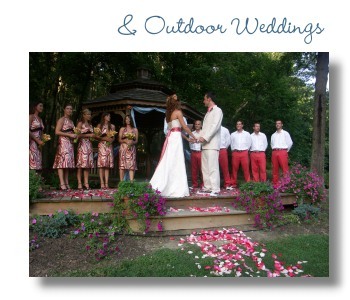 Plan your perfect outdoor wedding now at The Yellowwood Inn. Adventure Awaits. Escape to the woods to reconnect with nature and each other. Year round activities in Nashville and surrounding Brown County, include hiking, biking, shopping & antiqueing. Enjoy Monday Night Line Dance at Mike's Dance Barn. Go trail riding, zip lining or mountain biking. Enjoy Art & Crafts in Nashville, Indiana. Visit the Brown County Art Gallery, see historic works including Gustave Baumann, an American printmaker and painter, one of the leading figures of the color woodcut revival in America, member of the historic Brown County Art Colony. Thinking about retirement, or just want a weekend retreat? Brown County Real Estate is very hot right now! Close to Bloomington Indiana the IU campus, Lake Monroe and Brown County State Park, this is the perfect hoosier retirement location. If you love excitement...this is the place! From historic Story, Indiana take a canoe trek down Salt Creek or try a horseback, backpack or kayak trip. Top it off with mountain biking, a zip through the trees or a rugged game of paintball at Paintball Valley. The Bill Monroe Bluegrass Music Hall of fame is in Bean Blossom with its Blue Grass Hall of Fame, and Gnaw Bone Indiana offers antique malls and flea markets. Of course, it's ok to rent a log cabin, just sit on the deck & enjoy nature. Hoosier Group artist, T. C. Steele purchased two hundred acres in the Hills of Brown, twelve miles from Bloomington, in 1907. He and wife Selma built the "House of the Singing Winds". The gardens will soon be full of spring flowers & butterflys. Today, in the year 2016, artists and craftsmen continue to live and work in Nashville, and the surrounding hills & hollars of Brown County Indiana. They work out of shops and studios downtown Little Nashville, and they work from home studios in Story, Helmsburg, Bean Blossom, Belmont & Gnaw Bone. Visitors to Nashville & Brown County, may stop by the T.C. Steele state historic site, the Brown County Art Guild, Oak Grove Gallery, the historic Brown County Art Gallery, Grasshopper Flats, Monday Morning Leather and the homes and studios of artists and crafts people throughout the quaint village and countryside. New York Times article "Back home in Indiana". 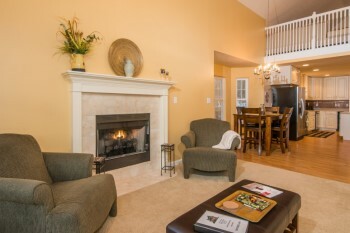 Wonderful hot tub rooms, suites, cottages & log cabins in and near Nashville. This historic hoosier artists' colony located in beautiful Brown County Indiana has been home and inspiration to many painters & craftsmen throughout time.